The Next Thrilling Cruise Ship Attraction? I love the internet because, of all places, it was George Takei’s public Facebook page where I first discovered what could become the next big cruise ship attraction: the SlideWheel. After all, its manufacturer is wiegand.maelzer, a German waterslide manufacturer already known for onboard installations. The original video I saw showed the product as a concept rendering only, and that alone looked pretty spectacular. Delving deeper on the company’s website, I now see that a prototype has actually been constructed, and it functions exceptionally well. So, just what is it? I’ll let you watch the latest video below to see for yourself, but one could best describe it as a sort of Ferris wheel waterslide hybrid. Rather than riders traversing the outer perimeter, they follow a continuous interlocking path in an enclosed tunnel. Remarkably, it can accommodate three sets of three- or four-person rafts simultaneously. The intricately conceived snaking of the loop ensures that the constant spinning motion of the overall wheel keeps them moving independently towards the end of the track as they ascend and descend fluidly. Of course, what makes this such a wonderful contender for a cruise ship is not only the thrills of riding it but also the eye candy of spectators watching its complexities from a distance. The best part is how relatively compact it is, compressing a lot of slide into a cubic footprint that could be easily accommodated on an open deck. Also, with an hourly capacity of 480 people, it would do a pretty good job of catering to the interested capacities of even the largest vessels during a week. As always, installing anything on a cruise ship is complicated by shifting centers of gravity along with safety and evacuation issues. But if any manufacturer can figure out a solution, it’s probably wiegand.maelzer. Its home page features cruise ship installations onboard the AIDAprima and AIDAperla, Genting Dream, Superstar Virgo and three Royal Caribbean International ships—the Adventure of the Seas, Liberty of the Seas and Harmony of the Seas. 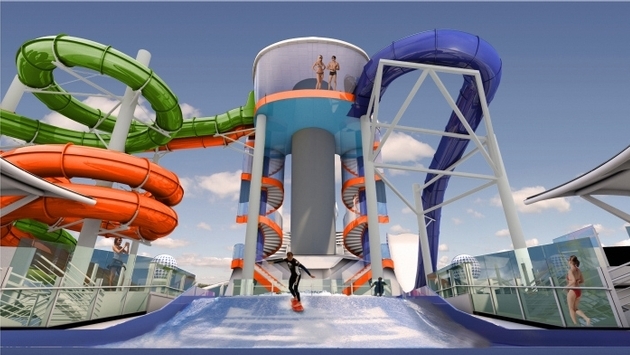 The company installed Liberty’s Boomerango water slide and Harmony’s Ultimate Abyss pair of dry slides, and both were never tried before. It’s even responsible for the shoreside Dragon's Tail Coaster on the line’s private island of Labadee. READ MORE: What Other Wild Attractions Could Make it to Cruise Ships? Thus, the SlideWheel is not too farfetched for a future cruise ship. Royal Caribbean could go all out by customizing the coloring of the attraction to match any number of schemes with various translucent and opaque sections lit with an abundance of interior and exterior lights. Just like the aforementioned Ultimate Abyss or its North Star on the Quantum-class of ships, a custom-titled SlideWheel would be another showstopping deck attraction perched on a new ship. Needless to say, I want them (or someone else) to try putting one onboard so I can ride it myself. Now I’m sure I’m not the only one.